Home » Will Solar Panels get Smaller? What Factors Influence Solar Panels’ Size? Solar panels have become an incredible resource for distributed energy generation in the US, China, Australia, and many other countries that deeply support this technology. As solar panels spread across the world, more and more land is being used to generate solar energy. But what if solar panels could get smaller? Land costs are one of the main factors that drive capital costs in big commercial and utility-scale projects. If solar panels get smaller, then more land will be available for solar panels or costs of PV projects would reduce. That sounds like an ideal scenario, but is the solar industry truly going through this path? In order to find the answer to this question, we must first understand the factors that affect the dimensions of solar panels. Let’s analyze them! The conversion of sunlight into electricity occurs inside every single solar cell. This conversion is not too attractive at solar cell level, since these devices can only produce about 0.5 V per cell. However, if we wire multiple solar cells in a series, we will obtain higher voltages and therefore higher power outputs. Solar panels are simply an assembly of multiple solar cells that are wired in parallel and series to increase current and voltage levels (therefore power outputs) to commercially scale values. Commercially available solar panels generally have 36 cells, 60 cells, 72 cells, or 96 cells. The number of cells will increase the size of the solar panel either in width or length (or maybe both). From the expression above we can realize that increasing the efficiency of the solar panel will reduce the amount of area (and therefore size) needed to obtain the same power output Pmp. Efficiency values depend on the type of technology applied. Top commercially available monocrystalline solar panels can reach efficiency values between 20% (Panasonic and LG) and 22% (Sunpower), while top polycrystalline technologies can generally reach 17%-18% efficiency. Therefore, power outputs and sizes might change depending on the model and technology as well. Single P-N junction silicon cells have a maximum theoretical efficiency value known as the Shockley-Queisser limit, which establishes that due to thermodynamic reasons, the maximum efficiency cannot surpass 33.7%. This would establish a limit related to how much we can reduce single P-N junction solar panel sizes. However, this value has already been exceeded in laboratory tests using multi-junction solar cells that have allowed to reach efficiency values close to 50%. The main issue with these technologies is that they cannot be commercially available yet because the additional cost to manufacture these solar cells on the market is still too high. Most applications for these technologies are related to aerospace applications, where the extra price for efficiency is totally worth it. The number of cells and the efficiency are indeed the main factors that influence the size of the solar panels. All other related factors such as power output, technology, or manufacturer may slightly change the length or width of the solar panel, but the changes are not radical. When we evaluate the progress of the PV industry, we realize that the development has come from the off-grid market towards the grid-tied market. In the beginning, solar panels were mainly used for simple off-grid applications like charging a 12 V battery. Nevertheless, when the solar industry started innovating in the grid-tied sectors, the 60-cell solar panels appeared in the market. Then, 72-cells appeared as the revolution of the solar industry, which allowed the achievement of higher power outputs. With these two technologies, the application for PV projects became much more attractive to investors (as costs per watt kept going down). All of this development increased the size of the modules, but as efficiency values were increasing, the relation between space, power outputs, and costs started to make sense. Generally, 72-cell modules have dimensions close to 1000 mm in width and 1960 mm in length and can achieve power outputs close to 400 W. On the other hand, 60-cell modules are generally 1000 mm in width and 1650 mm in length and can reach power outputs close to 300W. That’s 300 mm extra in length. If we compared that with original 36 cell solar panels, the difference is greater. Therefore, the trend seemed like solar panels were actually getting bigger, not smaller. If you think about it, makes sense. For project developers, it is more attractive to install fewer solar panels that have a higher power output and efficiency (despite they may be bigger) than installing smaller solar panels that will not produce as much power. Costs related to wiring, labor, mounting systems, and electronics like microinverters or DC power optimizers would be bigger and unattractive with smaller solar panels. It is important to notice the relation between size and efficiency, which can be confusing. Efficiency values are indeed increasing, but the progress has been slow and the increase of power outputs in the PV market has been greater and faster, therefore the dimensions of the solar panels must increase. After all, according to the expression above, if the power output and efficiency do not increase proportionally, then the area of the module must increase. 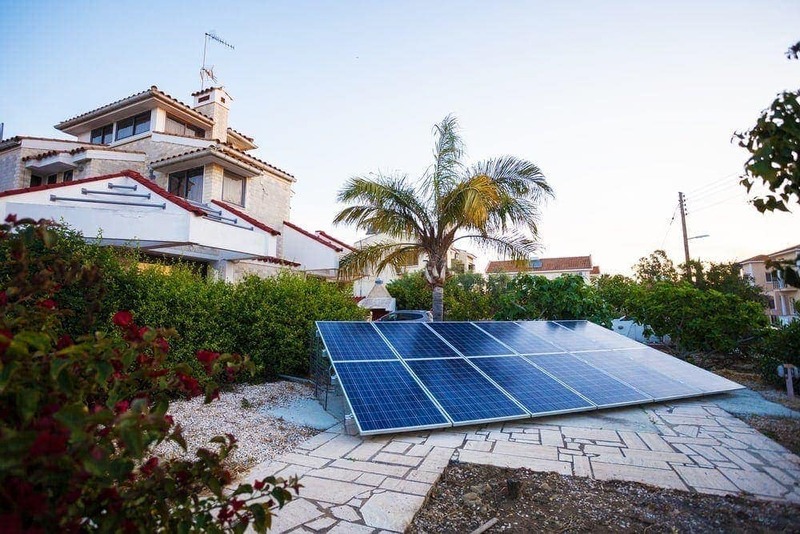 However, latest trends in the industry from remarkable solar panel manufacturers such as Panasonic and Sunpower have brought to the market the 96-cell product, with higher efficiency values and power outputs between 340 W and 370 W. These products have a width close to 1050 mm and a length of 1550 mm. In other words, despite the fact that these solar panels have more cells, the dimensions can be smaller in length than their 72-cell module counterparts, and similar in size to 60-cell solar panels. This means that the solar cells from these two brands are smaller, more efficient, and can produce the same amount of power with less area. It is not a coincidence that these two brands are in the top 3 of most efficient solar panel manufacturers. The truth is that as efficiency values keep rising, we might see similar results in other brands as well, maximizing power outputs and reducing dimensions. Maybe we are reaching the point where power outputs are finally stabilizing, efficiency values are going up, and sizes are getting smaller. Only time will tell if the trend changes or if these are isolated cases.